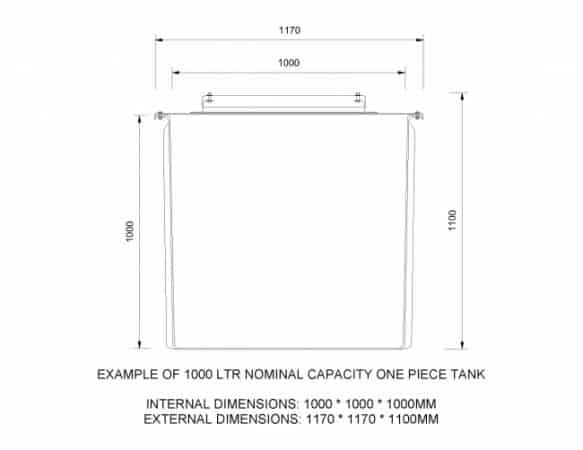 Size chart for our Standard tanks up to 10,000 litres, for tanks beyond this size up to 1,000,000 litres and Bespoke sizes Please contact us by Email or Call us on 0871 288 4213 where we will be happy to help and advise you on the best solution for your requirements. If you cannot see a size you require please contact us as we can look in to manufacturing you a bespoke tanks to the size you need without a large increase in the cost. These Sizes are available for all our GRP Tanks, for Potable water tanks, F&E Tanks and Balance Tanks and Also in our Chemical and Hot Water Tank ranges. CANT FIND THE SIZE YOU NEED? Contact us by EMail or Call 0871 288 4213. All tanks below 1000 litres do not require an Inspection Hatch for Water Regulations / byelaws. All sizes are available as Break Tanks, Balance Tanks, F&E Tanks, Chemical Tanks, Chiller Tanks, Header Tanks, Insulated and Uninsulated Tanks. All Tank require a Flat Fully Supporting Base. All tanks include an Inspection Hatch in the lid for easier access and inspection as required by the water Regs / Byelaws. All Tanks require a Flat Fully Supporting Base.